The Heliopan 37mm Cross Screen 8x Filter is a star effect filter providing 8 reflected light points stemming from specular highlights within the image frame. When the filter is rotated in front of the lens, the points shift in direction but always retain their symmetry. 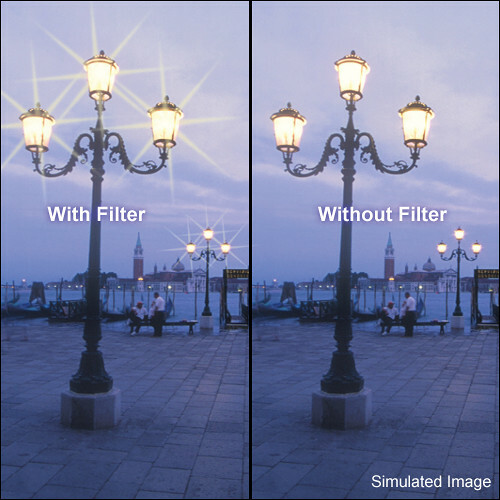 This effect is caused by thinly etched lines on one of the planes of the filter and is most prevalent when highlights are photographed against a dark background, such as a streetlight on a dark street. Cross screen filter providing 8 reflected light points that stem symmetrically from specular highlights within the image frame. Box Dimensions (LxWxH) 3.0 x 2.7 x 0.5"